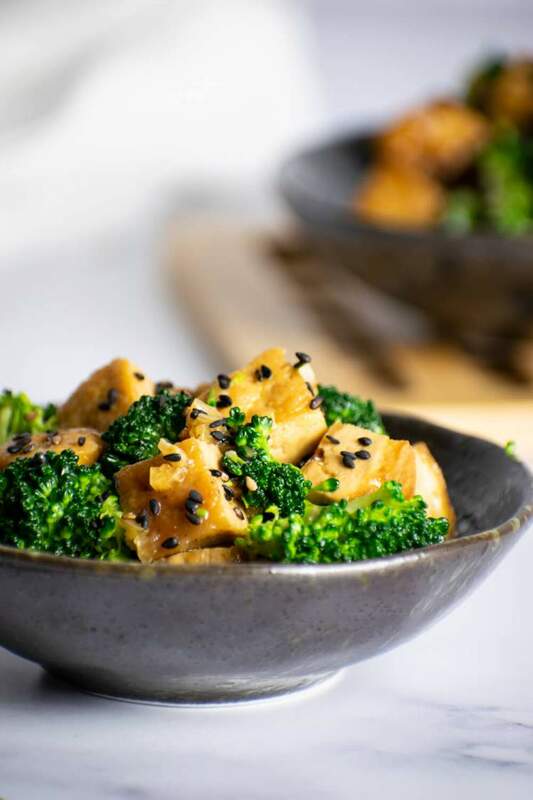 Sesame Tofu and Broccoli that comes out crispy and delicious in a sweet and savory sesame sauce is full of flavor and easy to make. This Crispy Sesame Tofu with Broccoli will change your mind about tofu. Whether you are a vegetarian or just looking to eat more plant-based meals, you’ll want to make this at home takeout dish. And if you love Asian tofu dishes, you will also want to try this Kung Pao Tofu and Sheet Pan Asian Tofu Stir Fry. By now you probably know more about my love of Chinese take-out than just about anyone. It ranks up there as one of my favorite comfort foods, but, unfortunately, even the vegetable and tofu dishes can be loaded with calories and extra fat. I didn’t realize this for a long time — going through life thinking I was making healthy choices but wondering why my health didn’t seem to really be catching up to my so-called choices. Then, I learned what food is really made of behind the scenes of my favorite restaurants. That was a real eye-opener! 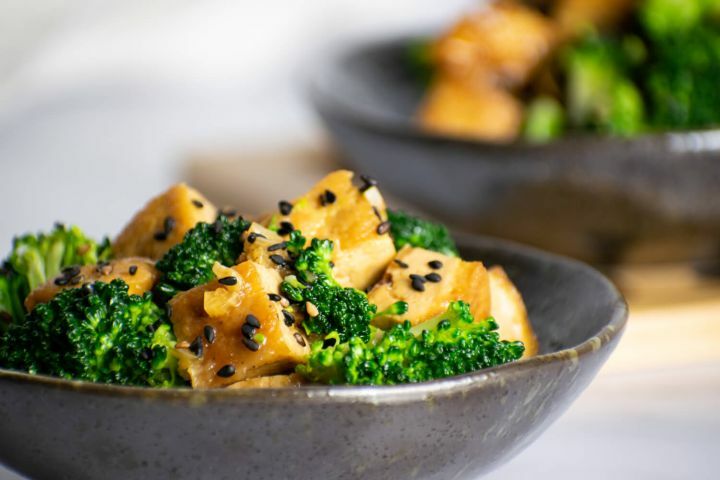 So, now, when I’m craving one of my favorite dishes, this Sesame Tofu with Broccoli, I typically choose to make it at home and choose ingredients that make it (and other Chinese take-out standards) as light and healthy as possible without sacrificing on flavor. 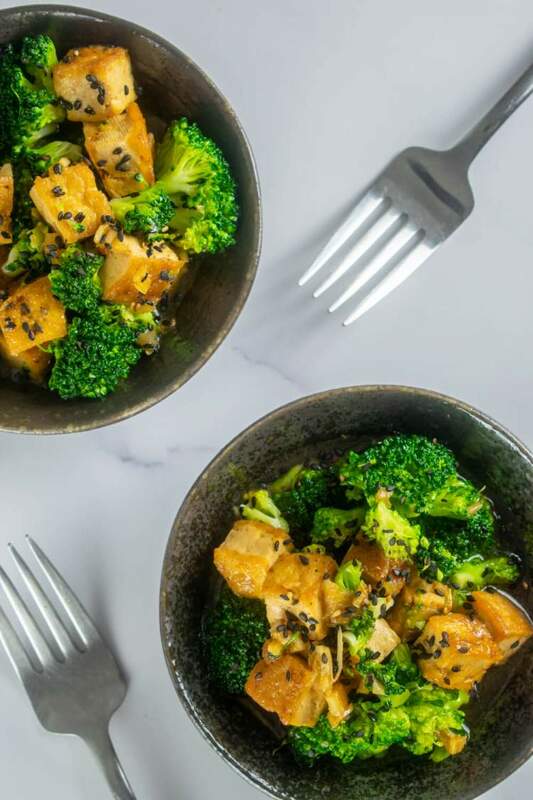 For this lightened-up version, I used pressed tofu and a homemade sesame sauce paired with lots of fresh broccoli for a yummy, as-good-as-take-out meal. Remember to press your tofu as much as you can to get out as much moisture as possible. If you don’t have a tofu press, use two heavy skillets and a lot of paper towels. Trust me, nothing ruins a dish like soggy tofu. But, when made properly, tofu is so yummy! This dish lends itself to all sorts of sides! I know I generally like to pile on the veggies but I say the more, the merrier! Crispy Asian Brussels Sprouts will add that little bit of crunch to your meal. Asian Zucchini Noodles make a great base for the main dish or work well on the side, too! A simple side salad is great with this dish. Try white or brown rice, or use another grain like millet, barley, or quinoa. Garlic Sugar Snap peas are such a treat! This is seriously my favorite way to eat snap peas. Make your own spring rolls with rice paper and fresh veggies. Add a peanut dipping sauce if you like. How about adding a little wonton or egg drop soup as a warming, hearty side? I like this meal straight-up, but there are many ways you can serve this dish. Veggie noodles of all types would be a great addition to this dish — mix them up for some amazing flavors and textures. Lay the tofu and broccoli atop a bed of lettuce. Personally, I like warm on top of cold — something about it reminds me of summer. Add a peanut dressing if you like to layer flavors. Serve this dish straight out of a bowl and eat with chopsticks for an authentic feel. You can add protein to this dish if you like — thinly sliced chicken or beef would work really well. Or, try shrimp if you want an Asian seafood dish. Swap it for the tofu or double up the protein. Put the ingredients in some lettuce cups (like Bibb or butter) or top it on large romaine or other leaf lettuces for a low-carb meal. Serve this dish cold on top of rice noodles. What Vegetables Go with Tofu? Can I Make Sesame Tofu with Broccoli in a Sheet Pan? Preheat the oven to 400 degrees. Still, whisk all the ingredients together as I have instructed in step 1. And go ahead and toss the tofu with salt, pepper, and flour. I would go ahead and still cook the tofu as I have in step 2 to give it that nice “fried” crust. (You are really going to be sad if your tofu isn’t a little bit browned). Then add the tofu to a sheet pan along with the veggies and pour over the sauce. Add this entire pan into the oven and cook for that 15-20 minutes as I have in the original directions. When it’s done, still go ahead and sprinkle those sesame seeds for a little added crunch and nutrition.